The Canadian Opera Company returned from its holiday hiatus with a perennial (and what could possibly be my own personal) favourite - Mozart’s The Magic Flute. Mozart’s last full operatic composition, this Singspiel with spoken dialogue is one of the most performed works in the entire world. With stellar gems like “Dies Bildnis”, “Ein Mädchen, oder Weibchen,” “Ach, Ich fühl’s,” and of course “Der Hölle Rache” it’s easy to see why you’d be hard pressed to find a city with a solid opera base that doesn’t have at least one production of this work per year. 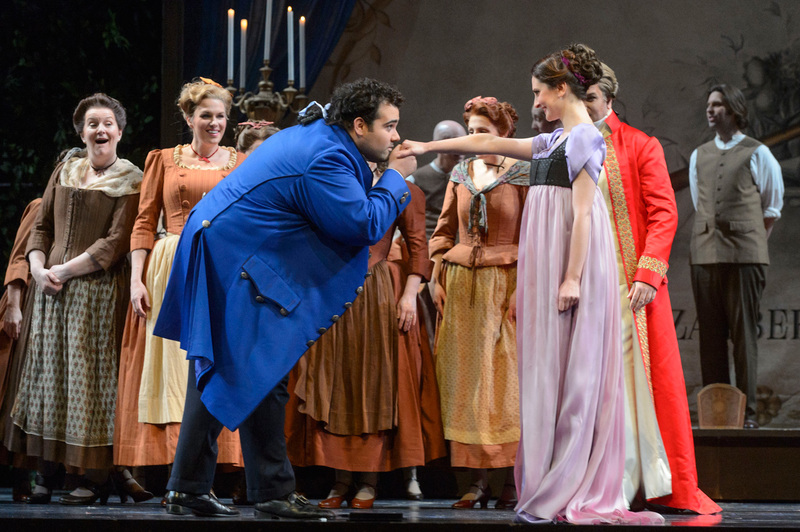 Andrew Haji as Tamino and Elena Tsallagova as Pamina in the Canadian Opera Company’s production of The Magic Flute, 2017, photo: Michael Cooper. Diane Paulus’ production, revived by Ashlie Corcoran at the helm, does quite well at loading on the imagery. Magnificent costuming and sets (Myung Hee Cho) and beautiful light work (Scott Zielinski) are well featured in this production. The show started with a wonderful pantomime during the overture where a rich lord is celebrating his daughter’s name day and all the opera’s characters aree actual members of the play-within-a-play. The second act drops us fully into their world as we follow Tamino, Papageno, and later Pamina through their trials to join Sarastro’s order, the union of male and female being pivotal to the outcome. The only thing I missed in this concept was the closing of the metatheatrical envelope. Once the second act started, we never saw the concept established in the first act return to complete the idea. As Tamino, Canada’s very own ‘Young Pav’ (There, I said it) Andrew Haji brings a loveable, quirky, and gentle young man with very real, visceral chemistry with his fellow players. From the first notes he sang in “Zu hilfe…” we were brought in with his free, easy, almost superhuman tone. The fluidity of his voice brought us an outstanding “Dies Bildnis…” and from curtain to curtain, Haji was electrifying. I was so excited to hear him sing this role on this stage, and even my high expectations were met and repeatedly exceeded. 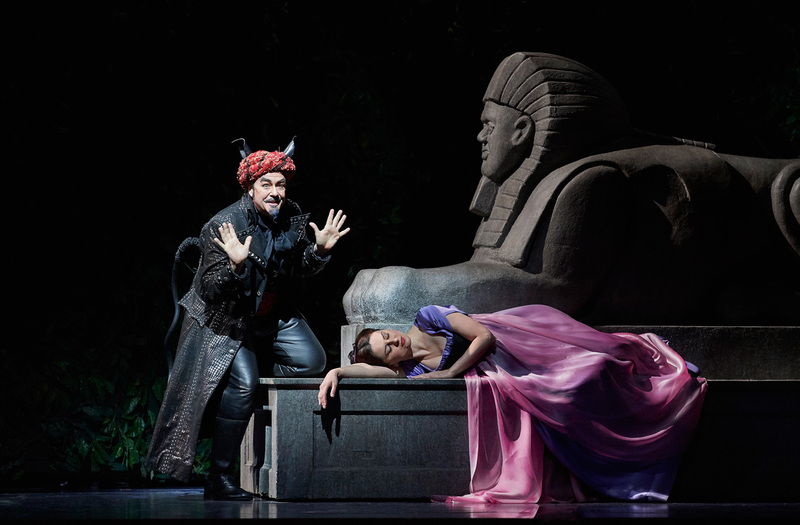 Andrew Haji as Tamino and Elena Tsallagova as Pamina in the Canadian Opera Company’s production of The Magic Flute, 2017, photo: Chris Hutcheson. Russian soprano Elena Tsallagova was a revelation as Pamina. A full, brilliant, womanly tone that still kept its sweetness even in its largest moments, assisted her beautifully in her portrayal of a young woman eager to start her own life on her own terms. Notoriously difficult, her aria “Ach, ich fuhls…” was one of the highlights of the show. The elasticity in her voice allowed her some very refined and aristocratic nuances in her delivery. Her duet with Papageno “Bei Männern…” was some of the most beautiful singing of the night. Joshua Hopkins brought his trademark birdcatcher to life with a fully realized “mensch” who defines “go-with-the-flow”. His physicality was a wonder to behold as he traipsed around the huge stage at the Four Seasons Centre. His robust, beautiful sound never wavered at any point during his extremely active portrayal and his delivery of the strophic arias “Der Vogelfänger bin ich ja” and “Ein Mädchen…” had such nuance that you forgot you were hearing the same melody four times. His chemistry with Papagena was palpable from start to finish. As Papagena, soprano Jacqueline Woodley kept pace and sometimes even brought Hopkins along for the ride. Her sweet, twinkling soprano was a perfect fit for Papageno’s dream girl. Also #GreenCharacterShoes. Where do I get them? 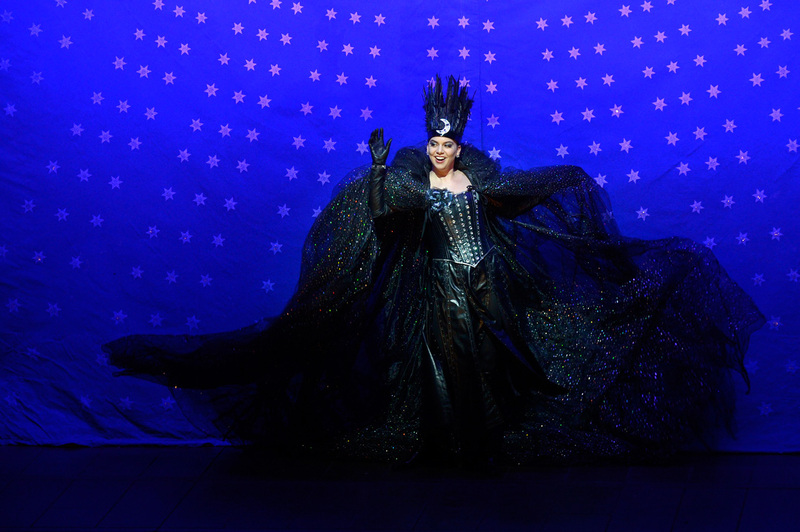 Ambur Braid as the Queen of the Night in the Canadian Opera Company’s production of The Magic Flute, 2017, photo: Gary Beechey. Back on the COC stage after turning everyone’s head as Dalinda in Ariodante, soprano Ambur Braid is everything you want in a “star-flaming queen”. Her two big arias were sung as close to perfectly as one could hope. Long and lean and beautiful she used every one of her assets while prowling around the stage. She was at the same time equal parts intriguing and intimidating. I could listen to Ambur sing me the phone book, if I’m being completely honest. Croatian bass Goran Jurić made his Canadian debut in the role of the high priest Sarastro. A full-voiced true bass, he cut an impressive figure across the stage and demanded your attention any time he broke the leg-line. His “In diesen heil’gen Hallen…” was beautifully sung and still remains one of my favourite bass arias of all time. 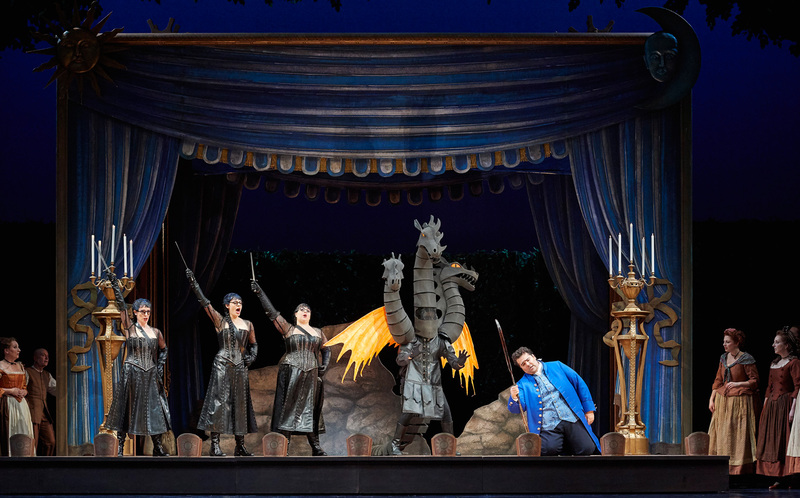 (l-r) Lauren Segal as the Third Lady, Emily D’Angelo as the Second Lady, Aviva Fortunata as the First Lady and Andrew Haji as Tamino in the Canadian Opera Company’s production of The Magic Flute, 2017, photo: Michael Cooper. The Queen’s three henchwomen - the Three Ladies - played by Aviva Fortunata, Emily D’Angelo and Lauren Segal were hilarious. Their goth/steampunk inspired looks made them a focal point in this late 18th-century setting whenever they were onstage. The two quintets (some of my favourite music Mozart has set) were exactly what the story needed to propel the comedy along. Each of the ladies sang with an exquisite sound and when the three of them sang together, it sounded as if they’d been doing it their whole lives. I was particularly impressed with D’Angelo. Her comedic timing was impeccable. I can’t wait to watch her develop. 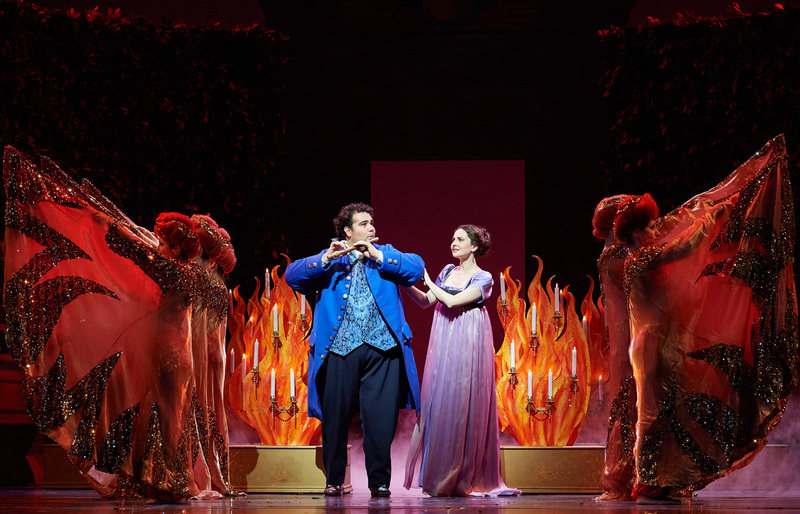 Michael Colvin as Monostatos and Elena Tsallagova as Pamina in the Canadian Opera Company’s production of The Magic Flute, 2017, photo: Michael Cooper. As the opportunistic moor, Monostatos, tenor Michael Colvin was also hysterical. His aria about wanting desperately to kiss Pamina was one of the best renditions I’ve heard to date. As the Speaker Martin Gantner sang with a clean bright tone, but carried all the stern haughtiness needed for this high member of Sarastro’s entourage. Charles Sy and Bruno Roy (in his COC mainstage debut) were excellent as First and Second Priest respectively and Neil Craighead and Owen McCausland as the two armed men sang together in a powerful display of vocalism. As the three spirits, the COC called up from the ranks of the Canadian Children’s Opera Company three bright young lights in the next generation of music. The three young singers blended beautifully while performing some pretty intricate staging. I was not only impressed but inspired. The COC Chorus under the direction of Sandra Horst sang cleanly and beautifully and spent a lot of time on stage adding to the activity instead of upstaging it. Bravi, tutti. Andrew Haji as Tamino with the Three Spirits (l-r: Sophie Filip-Vicari, Ella Farlinger, Clara Moir from the Canadian Children’s Opera Company) in the Canadian Opera Company’s production of The Magic Flute, 2017, photo: Chris Hutcheson. Music directed by maestro Bernard Labadie, I found the orchestra a little on the full side for some of the singing that was happening on the stage. I felt the tempi and dynamics leaned a little more to the Romantic (which I’m totally okay with) but at times I found the communication from the pit to the stage to be a little on the muddy side. That being said, it was still beautifully made music, there were just a few of the dangerous turns in the score still seemed a little unsettled. 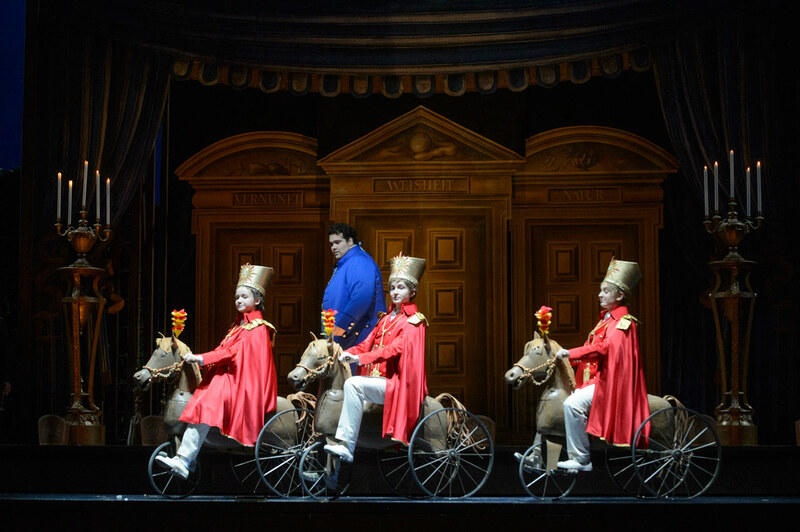 (l-r, centre) Bruno Roy as the Second Priest, Charles Sy as the First Priest, Goran Jurić as Sarastro and Martin Gantner as the Speaker in the Canadian Opera Company’s production of The Magic Flute, 2017, photo: Chris Hutcheson. Overall, this is an excellent production. There aren’t many “bad things” one can say about a really well-sung Magic Flute (as this one is). There are two casts for this run of performances, featuring Kirsten MacKinnon as Pamina, Owen McCausland as Tamino, Phillip Addis as Papageno, and Matt Boehler as Sarastro. Do yourself a favour, grab a ticket and hear this amazing cast sing some really amazing music. The Magic Flute runs at the Four Seasons Centre until February 24. For details and tickets, click here.